Photo courtesy of Cameron Huff. Box from remote control helicopter toy. Please keep this toy away from Virgin Soil. Copter in the hot tub! The Airplane of Hit — formerly known as Malaysia Airlines. Did we mention “copter get down”? Look! Up in the sky! It’s a bird! It’s a plane! It’s a whirlabou! No. The shootkey is toosmall. it will also deprave your intelligence! Caution: upon repeated use, ground may become so depraved that you’ll sink through and end up in hell. I’m wonder what the open power might be. Get down and deprave the ground now whirlabou. Those lasers better be real. I can doo all that, and I don’t need batteries. You deprave the very ground you stand on. Would you mind moving your car sir? We think it is depraving our carpark. ‘women desperate to get there hands round this enormous chopper’ oooh pardon! 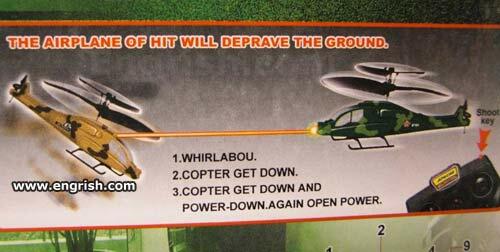 It will deprave the ground because it’s a Hell-icopter. With instructions like these the toy is probably a piece of hit. All your debase are belong to us! Shoot key to plane of hit! The airplane of hit will bring a world of pain. Then it’s off to depravity and bed without dinner for you. Next time, listen to your parents and avoid that Godless “getting down”. Whirlabou \ Whur·LA·boo-\ : A term derived from Canadian Airforce training manuals which describes a maneuver in which an aircraft flaunts around pointlessly. I went to play with one of those. after it got down, and opened power, the ground moisoned.